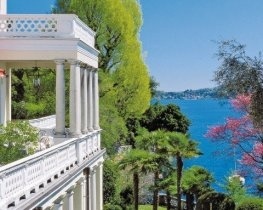 Located across the road from the lakeside and promenade, and a short five minute walk from the town centre of Stresa, classically elegant Hotel La Palma offers gorgeous lake views from its delightful gardens and terraces. Traditionally styled guest rooms and suites feature balcony and a view of the mountains or the lake. The restaurant serves a buffet breakfast and excellent Italian and international cuisine in the evenings, and during warm summer months the stylish Sky Bar on the rooftop offers light lunches and snacks throughout the day and features a spacious sun terrace with a Jacuzzi pool; perfect for relaxing days in the sun. There is a spa with a range of massage and beauty treatments as well as a sauna and steam room, and a fitness room with panoramic views of the surroundings, and just across the road is a shingle beach and the hotel’s outdoor pool. Pre-dinner drinks at Hotel La Palma’s Sky Bar are an absolute must if you’re staying in Stresa. 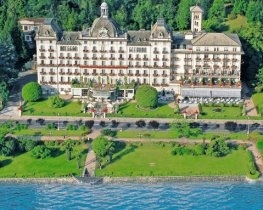 You can socialise and listen to music whilst enjoying the tremendous range of delicious aperitifs plus, of course, the view is simply superb with a panorama of glittering lake and picturesque islands; all surrounded by majestic mountains whose peaks are lit as the sun sets behind the hotel. Hotel La Palma will guarantee interconnecting rooms subject to availability.